Sheri Candler has a thoughtful follow-up to her previous post about the potential for crowdsourcing to turn into a form of exploitation. Although I argued that participants in a project like Life in a Day might get involved for non-monetary reasons, I generally agree with her thesis that filmmakers should compensate contributors for their involvement, but I am pointing to the argument because I think it illustrates one of the thornier issues out there when it comes to media culture today and the role of the “audience” in producing value for an entertainment property. I’ll start by stating that one aspect of Sheri’s argument still perplexes me a little. She treats contributors to Life in a Day as if they are aspiring independent filmmakers who contributed out of a desire to be discovered, noting the attraction of having “your work would be held up there right alongside theirs.” I’m sure there were a number of filmmakers who contributed out of a desire to be discovered, but again, I’d argue that a number of other motivations (self-expression, curiosity, boredom) likely drove people to contribute. I’d also wonder how many filmmakers out there believe this is an opportunity for discovery given that they were likely to get just a few second–probably a minute at best–of screen time in the final product. But I think Sheri offers some astute suggestions for compensating participants in the project. Her suggestion of a $100 licensing check for contributors whose footage appears in the film seems like an effective payment compromise, but I’d argue that some of her other suggestions are even more effective. As she suggests, Kevin Macdonald and Ridley Scott could have done monthly video chats with YouTube users as a way to engage with contributors (an approach that likely would have helped to sustain enthusiasm for the project and build anticipation for the theatrical release). 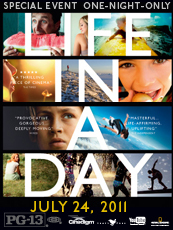 Sheri also criticizes the producers of Life in a Day for pulling the film offline and argues that it should have been freely available on the web under the assumption that positive buzz would have drawn people into theaters. I’m a little skeptical on that point. Making the film available for free likely reduces the urgency to see it on the big screen, although I am well aware of the exceptions to this rule. Of course, crowdsourcing is just the tip of the iceberg when it comes to the role of audiences in producing value (and I think Sheri is acutely aware of this point). We also produce value by going on Flixster or Netflix to rank films, by mentioning movies and TV shows on Twitter or Facebook (data which is now compiled by marketing companies). A number of scholars have even argued that the mere process of watching TV is a form of labor because your attention is being sold to advertisers. To some extent, crowdsourcing is always implicated in that process of producing value, but as Sheri suggests, there are ways of rewarding participants by creating more inclusive, engaging forms of culture. One year ago this weekend, directors Ridley Scott and Kevin Macdonald commissioned YouTube users to produce video depicting an aspect of their daily life and to submit it to a designated channel on the video sharing site. 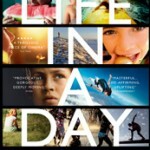 The directors would then take that footage and compile it into a feature-length documentary, Life in a Day (more info here). Now, on the anniversary of that event, YouTube, along with National Geographic Movies, is distributing the film theatrically in a limited nationwide release (a list of theaters is available here). As a number of people have observed, the story of the film’s production is awash in the language of crowdsourcing, with Life in a Day’s YouTube page describing the movie as “user-generated feature film.” I haven’t yet seen the film–although I hope to see it soon–but the planned release has sparked a renewed discussion of the implications of crowdsourcing within the movie industry. Specifically, what does it mean if studios are profiting off of the work of hundreds, or in this case, thousands of participants who contributed footage (some estimates suggest the filmakers received over 81,000 submissions of over 4,500 hours of footage) that was considered for the documentary? Marketing and publicity expert Sheri Candler looks at the process for Life in Day and points out that participants likely signed a consent form (which they, of course, did voluntarily), giving over rights to the footage. More crucially for her, they are now expected to participate in the marketing of the film as part of the “marketing SWAT team” designed to create buzz and fill seats at a local movie theater. Although she acknowledges that contributors receive a “co-director” credit, that credit doesn’t appear on IMDB, and users do not profit financially from their participation. Finally, she worries that users cannot even see the film since it is not available online. Candler has some reasonable arguments regarding the potential for financial exploitation here, and this is something that I have been weighing quite a bit when reviewing the appeals toward crowdsourcing made by a number of independent filmmakers. Edward J. Delaney, writing for Documentary Tech, takes this a step further, arguing that many of these crowdsourcing initiatives create a “false relationship” between the user/audience and the producer/filmmaker. Delaney’s argument is enticing, especially given the use of affectionate terms to describe people who contribute to the production of a film. Delaney and Candler are likely right to surmise that some participants are seduced into believing that their participation will serve as a bridge into the film industry, that they will be “discovered” (to use Delaney’s phrase) due to their contributions. There is certainly a culture of celebrity within YouTube, one that is reinforced through the various “success stories,” in which amateurs gain international attention through their videos. And, yes, National Geographic is a profit-making institution making a film in which many of the participants are working as volunteers. Crowdsourcing leaves open the potential for exploitation, and fan activity, in particular, is uncompensated, even while studios can use that activity to build attention (and presumably profit). But, as I suggested on Twitter, we need a more nuanced understanding of why people chose to participate in Life in a Day. The film has been billed as a kind of anthropological “project,” a snapshot of a moment in the history of the world. There might be significant non-monetary reasons to contribute to such a project, including the attempt to provide a more vivid portrait of that particular day. Where are we? What is our world really like? How can we make the world a better place? Sure, it’s easy to take advantage of people’s good intentions, but to some extent, the argument that people are being duped assumes that they are unaware, dupes of participatory culture. I don’t think there is significant evidence to support the claim that “most [participants] probably think it might get them somewhere.” Candler is certainly correct to argue that filmmakers should make a conscious effort not to exploit their audience when using the techniques of crowdsourcing, and certainly many projects (including Life in a Day) have the potential to generate enormous value for major media conglomerates, but to some extent, I think that perceiving crowdsourcing merely as free labor misses the many ocmplicated motivations that might inform people’s desires to participate in producing or promoting a movie or TV show. No doubt, Dixon is correct to identify price as a key factor in Redbox’s emergence. $1 per day is comparatively cheap, especially against VOD and even arguably Netflix, and this is where Redbox is actually quite a bit different than typical bricks and mortar stores that have to pay rent for comparatively large retail spaces, as well as wages for multiple employees per store. But even this pricing logic is part of the logic of digital delivery, in which consumers are increasingly being condition to view content as cheap and even to view temporary access (rentals, windows, etc) as a viable alternative to ownership. In other words, Redbox is part of the same trend in which DVD sales, regardless of format, are plummeting (side note: this is why I think UltraViolet will struggle to find a viable niche). Dixon also surmises that Redbox users may also be unable to afford cable and may be less likely to be frequent computer users. There is potentially some truth to the latter (especially when it comes to broadband access), but with estimates that nearly 90% of homes have some form of pay television, I would need a little more hard data to conclude that most Redbox users have limited access to other forms of entertainment. And here is where some of Dixon’s biases toward art house (or at least non-commercial) forms of cinema seem to limit his approach and where I had some reservations about his arguments. Dixon starts with a pretty surprising assumption, commenting that Flow readers have likely seen a Redbox kiosk and “perhaps you’ve had occasion to even use one, too, although given Flow’s readership, this latter prospect is somewhat unlikely.” Dixon goes on to dismiss the typical Redbox customer as a ” lowest common denominator viewer,” one who is interested solely in “Top 40 hits,” enthralled by (or perhaps dupes of) gossip magazines. There are a number of issues here. On the one hand, Dixon’s comments seem to ignore the fact that Flow offers some of the best criticism out there of popular texts (reality television, Glee, blockbuster films). And while Dixon is no doubt correct to point out that Redbox likely won’t have the latest Criterion title–you can go to Hulu for that–we’ve recently rented Black Swan, Barney’s Version, and several other films that might be popular but that are, I would argue challenging, engaging, and (in the case of Black Swan), even difficult films. Redbox does cater to families with children, often in rural, suburban, or exurban areas, so that will no doubt shape the available choices, but as an inexpensive complement to other forms of digital delivery, one that can encourage relatively spontaneous movie rental decisions. We sometimes stop off and grab movies from Redbox on our way home from the gym, especially when those titles aren’t yet streaming on Netflix, and usually return the movies the following day. My point here is that it’s difficult to extrapolate how a technology or service is being used merely from a quick glance at movie titles or even from other features of the service. We have cable, broadband, and Netflix (streaming and DVD), and yet there are occasions where grabbing a movie from a kiosk is preferable, especially now that there are no independent video stores within 20 or 30 miles. I’d also argue that it’s probably somewhat rare to have an individual or family that consumes movies through a single platform given the diversity of choices out there. Finally, despite the changes in access enabled by cloud computing, it seems likely that the physical presence of the DVD will continue to play a role in digital delivery much longer than many of us might expect, even if we are getting discs out of a kiosk rather than buying them at Wal-Mart. Update: I forgot to mention in this post that Redbox president, Mitch Lowe, who attempted to create a kiosk rental system as early as the 1980s using VHS tapes, has stated that he will be stepping down to pursue other opportunities. It will be interesting to see how that affects Redbox’s practices as a company and whether they will move more aggressively into streaming video in the near future. CNET reports that Netflix anticipates at least some backlash over their price increases. In response, Blockbuster has stepped up their efforts to market their DVD subscription plans. Ryan Lawler traces the anticipated sources of advertising revenue for TV advertising as more and more people turn to connected TV sets and streaming TV. The Economist has launched its new documentary film website, providing documentary filmmakers with yet another site for finding an audience for their films. The IFC Blog reports on an MIT study that considers biases in the “star systems” that are typically used to evaluate movies on sites such as Netflix, where those rankings inform recommendation algorithms. The author of the study, Devavrat Shah, suggests that external factors, such as the user’s mood, may affect ratings and proposes that more accurate rankings would be produced if films are paired. On a related note, USC’s Annenberg Innovation Lab has launched a new tool, the USC Annenberg Film Forecaster, that seeks to quantify anticipation for an upcoming movie. The tool measures both the number of tweets and the sentiment expressed in those postings. One interesting example: they were able to track the fact that Green Lantern was getting quite a bit of buzz but that approximately 40% of it was negative. One of the difficulties they are addressing is how to teach the tool to recognize sarcastic tweets. The tool is also limited by Twitter’s ostensibly younger demographic, suggesting that adult-oriented films may get fewer mentions. This is more for fun, but someone has created an amusing infographic showing which Netflix films are popular in different parts of the country. Netflix has announced that they are raising their prices, which tehy will do by splitting their streaming and DVD-by-mail plans. New Tee Vee speculates that Netflix may be making the move to entice more people to choose the streaming-only plan, reducing infrastructure costs. Either way, customers are given a choice between two bad options. The Los Angeles Times more politely attributes the price change to the “challenging economics” of the entertainment industry, but as the IFC Blog points out, Netflix can’t really pretend to be hurting for money, given their recent plans for expansion into Latin America. The median age for viewers of broadcast television inched up to 51.6 years old, according to Media Life. IndieWire blogger Anthony Kaufman has relaunched his blog as Reel Politik, and his new focus will be the intersections between film and politics. As Kaufman notes in his inaugural post, these issues are worth considering, given the hotly contested upcoming election. Kaufman also sees his blog as a potential counterpoints to conservative and right-wing blogs that attempt to shape the perception of Hollywood. Kaufman’s earlier post on the politics of Hollywood blockbusters and a more recent discussion of the new Sarah Palin doc provide ample evidence of why this kind of blogging can be beneficial. I’ve considered shifting more explicitly toward this focus here, so I’m glad Anthony is tackling this.